Usually, when I notice that a product’s official name has the words ‘deluxe,’ ‘premium’ or ‘professional’ in it, I get quite skeptical. I’ve been reviewing products for quite a while and I’ve picked up a healthy level of suspicion for product designations that use ‘loaded’ terms such as the one used in the Tefal FV5370G1 Aquaspeed Ultracord Premium Steam Iron title. It is easy to see why manufacturers would want to describe their products with such value-loaded words. After all, the name of the game is sales, right? Unfortunately, the consumer gets the short end of the stick when they buy a product that has ‘premium,’ ‘deluxe’ or ‘professional’ in the product’s official name but the product falls far short of the expectations produced by such words. This is a fairly common problem that arises when the manufacturing and design prowess of a manufacturer seems to lag far behind the imagination of its marketing division. Accordingly, I have developed the habit of being extra critical and wary when I see such words included in the official name of a product. If the manufacturer is going to use such loaded words, it better step up to the plate and deliver a solid value proposition. 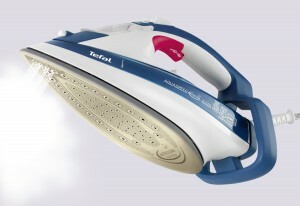 Thankfully, the Tefal FV5370G1 Steam Iron lives up to the full meaning of ‘premium.’ It is loaded with many great extra features that it is able to deliver a solid value for a relatively small amount of money. Powered by 2400 watts, this model is no slouch when it comes to heating up. While far from the hottest steam iron in the market, it reaches very high heat levels to produce a solid 170 grams per minute shot of steam. Combine these with the continuous 40 grams of steam it releases and you have a solid crease-busting steam iron that’s serious about business. 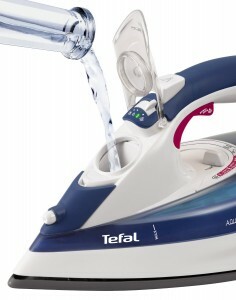 What makes this Tefal model so formidable is the placement of the steam release. This unit release steam near the front of the unit-the Steam Power Zone. Paired with the normal forward motion of the iron as you work on surfaces, this iron can definitely get effective heat and steam where it needs to go on the surface you are working on. Knocking out wrinkles is very easy with this device because all its heat and steam power is located in a key section of the iron. Since the front tip is the first point of contact as you move the iron from one end of a fabric surface to the next, this iron saves you quite a bit of time as far as creating smooth surfaces are concerned. This efficient layout reduces the need to go back or double up on the passes you make on a surface to make sure it looks the way you want it to look. Not only do you save time, you also feel less tired or stressed after ironing. After all, most consumers would rather not iron at all. They’d rather be elsewhere. It appears the designers of the Tefal FV5370G1 Aquaspeed understand this reality all too well and their design helps make the ironing experience as quick and as painless and hassle-free as possible. While many of the steam irons on the market today claim all sorts of amazing soleplate materials which reduce drag, eventually the friction of small fibers get the best of them. While your first few months using a new steam iron is very smooth and quick, eventually enough fibers stick to the soleplate that the iron meets more and more resistance every time you use it. Eventually, you’ll reach a point where you have to manually ‘push’ the iron across a fabric’s surface. This can definitely wear you out and stretch the time it normally takes you to iron a load. This experience is far from quick, painless, and hassle-free. Unfortunately, this is the fate of most steam irons regardless of the materials their soleplates are made of. While fancy soleplates can resist the drag created by stuck tiny fibbers for quite a long time, enough fibbers eventually accumulate on the typical soleplate to make ironing a frustrating chore once again. Instead of that quick ‘glide’ you’ve come to expect, you end up feeling like you’re dragging a traditional heavy coal iron. The Tefal FV5370G1 Aquaspeed solves this very common problem through an autoclean system that is designed into the soleplate. The soleplate of this model is designed in such a way that it quickly burns those pesky microfibers so they don’t get a chance to accumulate. 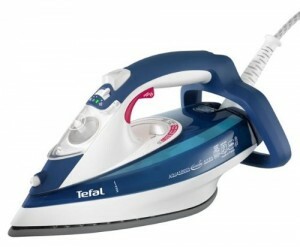 While no soleplate is 100% immune from small fiber accumulation forever, this Tefal model’s design definitely ensures that you’ll be enjoying a smooth ironing experience for a much longer time than the typical steam iron on the market. In addition to having a soleplate that’s designed to cut down on fabric drag and fiber accumulation, the Tefal FV5370G1 Aquaspeed Ultracord Steam Iron also has safety engineered in. Its water intake is at the top of the unit so you don’t have to hold the iron at weird angles just to refill it. Indeed, handling a heavy iron at a weird or awkward angle as you refill right in the middle of an ironing job can be a surefire recipe for disaster. Refilling this unit is very easy, just pop the front refill cap open and fill. Also, the hole is very wide so you don’t have to worry about spilling water on the hot surface of the iron’s top. To top it all off, this model has anti-lime scale formation features. By holding back calcium deposits from forming, the tiny sensitive water channels of this steam iron can work for a longer time. You get more value for your money because you don’t have to replace your iron prematurely. This is one product that truly lives up to its ‘premium’ designation. You get a superb mix of steam power, heating power, product life extending design, and fiber drag prevention in one fairly affordable package. Not a bad deal at all!